This is a view from 3,700 km above Europa. Behind it is Jupiter with the Great Red Spot and the shadow of Callisto both visible. The two moons to the left are Io (leftmost) and Ganymede. This is a revised version of my first space art effort, largely inspired by Björn Jónsson's web site. For the cylindrical map of Europa, I took a black-and-white map from the USGS-Flagstaff web site and colorized it based on the colors from a typical Galileo image of Europa. The cylindrical map of Jupiter is from the Cassini web site (representing its appearance during the flyby in December 2000). Both maps are missing data in some areas, particularly the Jupiter map near the poles. I filled these areas with a single color from a nearby region. The field of view is 45°. 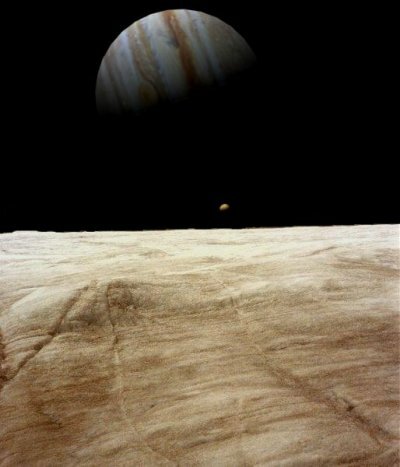 This view is from the surface of Europa, looking towards Jupiter with Io visible in the foreground. This image actually precedes the others. The view of Jupiter and Io was created in Simply 3-D using the previously mentioned cylindrical map from Cassini data. The foreground is a colorized portion of a photograph of Athabasca Glacier in Alberta, Canada, taken by Linda Johnston in 1989. 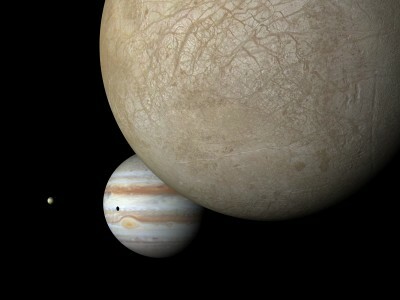 This view is from 990 km above Europa's surface. 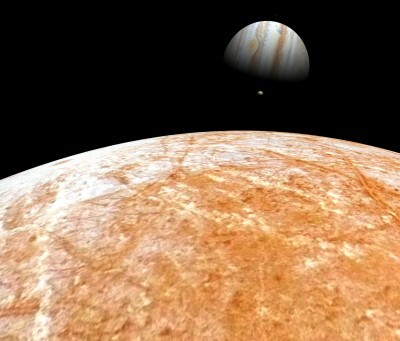 Visible next to Jupiter are Io and Ganymede. The linear fracture leading to the horizon below Jupiter is at least 1500 km long. Field of view is 34°. 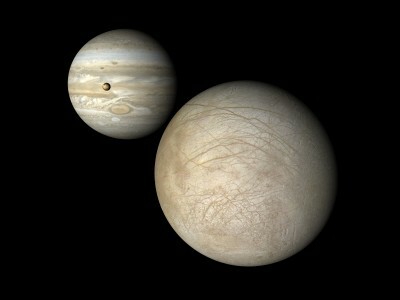 The Jupiter map is the same one used in renderings above. The Europa map is from the USGS-Flagstaff web site incorporating some color information from Björn Jónsson's new Europa map. This wide-angle view is from only 435 km above the surface of Europa. The fresh crater Pwyll is visible at the left, surrounded by rays of ejected material. Jupiter and Io are also visible. 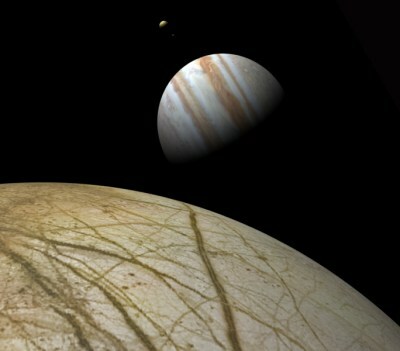 The partial Europa map is modified from a Galileo image of Europa. This view is from 7,800 km above Europa, with Jupiter and Io visible in the background. Field of view is 40°. The Jupiter map is Björn Jónsson's new Jupiter map. The Europa map is from the USGS-Flagstaff web site incorporating some color information from Björn Jónsson's new Europa map. Last modified 27 December 2002.